Turnitin is a plagiarism-prevention service sometimes used in Brightspace assignments. Not all instructors will use Turnitin. If your instructor has enabled Turnitin in your Brightspace Assignments, your submissions will be automatically reviewed by this service. If your instructor has enabled Turnitin on an Assignment, you will see this icon next to your assignment under Assessments > Assignments. Submit your assignment as usual. Click Done or click View History to see your submissions. To see your submitted assignments, navigate to Assessments > Assignments and click on the View History button. If your instructor has enabled this feature, you will see your originality score under “Turnitin Similarity.” This score reflects the similarity between your paper and other papers in the Turnitin database. What this means is that content from your paper or assignment is also found elsewhere on other documents within the Turnitin database. Your instructor will speak to you directly if they have questions or concerns about your work. If you go to your Submission History immediately after submitting the file, you will see “In Progress” next to the Assignment; the score may take some time to appear. Click on the score to view your originality report. A new window or tab will open and load the Turnitin Feedback Studio. A navigation pane on the right side. 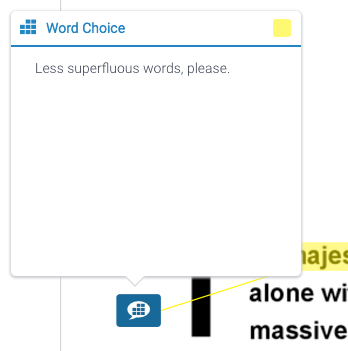 In addition to the Originality Score, your instructor might use several or none of the feedback options available in Turnitin. These are some of the feedback types you might see in Feedback Studio. your scorecard under Instructor Feedback in the navigation pane. Click View Rubric to see your scorecard. Your instructor may also assign a rubric criterion to a Bubble Comment. These Bubble Comments will be displayed with a Rubric icon inside it. Click the icon to open the bubble comment and see the associated criterion. You can also investigate your Originality Report using the navigation pane available on the right side of the screen. Layers shows the active layers: Grading and Similarity. You can choose to activate or deactivate either or both. 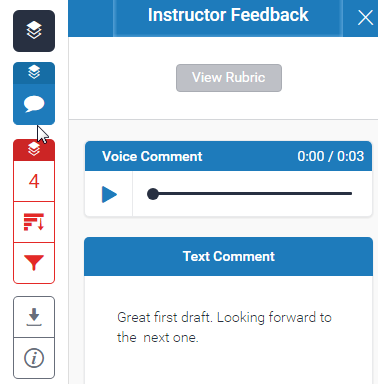 Instructor Feedback: If there are overall Text or Voice comments on your assignment, you will see them here; this is also where you will see the assignment rubric, if your instructor has attached one. Match Overview shows a list of all matches from your paper with other texts in various databases. Depending on the settings chosen by your instructor, this may or may not exclude cited quotations or the bibliography. All Sources shows a list of all sources identified from text in your paper. Filters and Settings allows you to exclude certain matches from your paper to see whether removing these segments of text affects your originality score. A Digital Receipt, which functions as a record that your paper submission. For more information about Feedback Studio, you can view the Turnitin Instructor Feedback Guide here.